Free Goal Setting Power Point - Download Now! you want to do with your life! Here is a free Goal Setting Workbook for you to download and use to plot your dream life! It's totally free, so print it off, scribble in it, and use it as a companion to keep you on the road to success. Please do send a copy to your friends too. Download the free Goal Setting Power Point NOW. This download is designed to help you identify your deepest values, decide what you truly want to do with your life, and set action points to make your dream a reality. To be really useful, however, you need to answer all the questions as honestly as you can. After all, these are your dreams we are defining - and not somebody else's. Make the commitment to yourself now that you will answer truthfully - and dream as big as you want to. 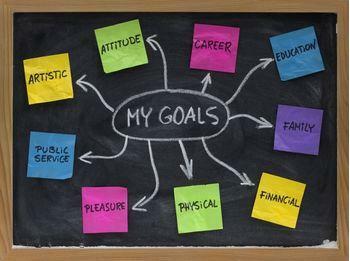 Before you start, it may help you to read some of my Goal Setting Articles - although this is not essential. (1) Relax. Take some deep breaths, slow your heart rate, and ask your subconscious to help you out. (2) Read the question. Take some spare paper and a pen, and scribble down EVERYTHING that comes into your mind. Don't censor - you can delete the stuff that doesn't fit later. (3) Keep on writing! Keep writing until you have totally exhausted every possible answer. Remember that some of the greatest insights will surface just before you give up. (4) Review your answers. When you have finished a question, go over your answers and highlight the ones that really connect with you at a deep level, make you feel excited, or just "feel right". (5) Note your answers in the booklet. Finally, use the goal setting Power Point to keep a record of all of your final answers, which you can refer to at any time. Download the Free Goal Setting Workbook NOW. Good luck - and follow your dreams - what else are you going to do with your time?! PS - Do you find Personal Development Planet useful? If so, subscribe today for a monthly update with new articles, book recommendations, freebies and much more.